While the Glycemic Index (GI) of a food tells you how rapidly that type of food effects your blood glucose in the 2-3 hours after eating, it doesn’t tell you how significant that impact is based on the serving size or amount you eat. That’s where the Glycemic Load (GL) becomes far more helpful – as the load of a food takes into consideration the quantity of carbs per serving. Questions about portions and glycemic load is one of the most common questions we receive. To understand it, you need to first have a basic understanding of the glycemic index itself. 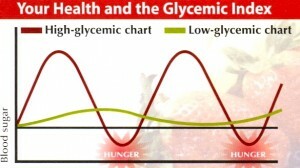 Without a glycemic index for a given food, you can’t calculate it’s glycemic load. Reference: See our glycemic index chart for a full table listing of food GI and GL scores. Researchers at the University of Sydney lead the research on GI, which focuses on the types of foods and it’s inherent impact on blood glucose, digestion, nutrition, diabetes, and weight loss. While the glycemic index focuses on the quality of carbs rather than quantity, the Glycemic Load takes the raw GI score and factors in quantity. For those who have asked questions such as “how can Frosted Frakes have a lower (better) GI than my fruit”, the glycemic load is a more accurate and for many is the only tool they use to manage food selection. Glycemic load takes a foods GI score times it’s available carb content (in grams) per serving. Portion Sizes, Glycemic Index and Glycemic Load – Does it Matter? Do portions matter? Of course they do, but technically speaking as far as the glycemic index (GI) they don’t. The GI of food is the same whether it’s 4 ounces or 4 pounds, as it’s only reflecting that individual foods tendency to raise your blood glucose – regardless of the amount. Glycemic load, which was introduced after the initial glycemic index values we’re first published, fixes this by taking the GI and adapting it for portion sizes, amount of carbs and fiber. Individuals during testing consumed test foods and then had their blood glucose levels measured. This was compared, in very controlled fashion (some with individuals with diabetes, some without) to the reactions on blood glucose for those same individuals to other food groups to measure variances. How Much Glycemic Load Is Acceptable Per Day? This is difficult to estimate, but it’s recommended as a general guideline for those seeking a weight loss diet to target a total GL of 60 – 80 grams per day (1 ounce = 28.3 grams). Another guideline is to try and keep food choices to low and moderate selections (GI under 55 per food selection). Incorporating the glycemic load into your nutrition and wellness program should be done in combination with other factors. In general, the amount and type of carbohydrates (simple vs. complex), amount of fat, fiber content, and protein are all important factors. Since the glycemic index chart values is most applicable to carbohydrates, low or no carb foods such as lean meats or just high protein focused foods will not be referenced much. For those who prefer a diet rich in vegetales and lean meat / fish, you will find the glycemic load and index values very easy to adopt and follow. When incorporating food types such as rice, pasta, and other grain based foods, be sure to closely look at their glycemic load factors to make an informed decision. Your equation should be revised to be sure that the Net Carbs is not in the denominator of the equation.